The new calibration system will use advancements in atomic, molecular, and optical physics to revolutionize the precision of planet hunting. Your donation goes further – it will be matched! Debra Fischer and her team from Yale are among the best planet hunters in the world. To find planets outside our solar system, they need to be able to detect incredibly small wobbles in a star’s motion; their goal is to be able to identify variations as small as ten centimeters per second. Today, they can look at a star that is about 38 trillion kilometers away and detect the star’s velocity changes at a speed equivalent to a human walking...but with your help, they’ll be able to spot a variation that’s roughly the speed of a giant tortoise. 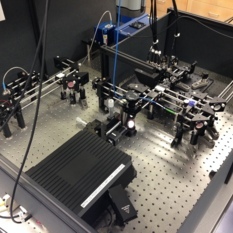 With $65,000 from citizen scientists like you, the Fischer team will use a laser system with triple lock stability to turn a Fabry-Perot frequency comb into a remarkably precise calibration system. A generous donor has agreed to match all the donations we collect. That means your donation goes twice as far bringing us that much closer to our goal. Please make a donation to sponsor the new laser system and help find more exoplanets!